Title: "We're Not Cashing In"
Welsh trio hold press conference on their millennium gig and "harder, faster" new single. Manic Street Preachers held a press conference last week to announce the full details of their New Year's Eve gig at Cardiff'S 54,000-capacity Millennium Stadium - and to hit back at critics who have slammed the £30-a-ticket event as an attempt to cash in on millennium madness. "We're not making any money on this gig," insisted bassist Nicky Wire. "If we sell it out, then we break even. The drinks will stay at normal prices - none of this £6-a-pint rubbish. A lot of people are trying to cash in on the millennium, but for the first time in our lives it's some sort of genuine celebration. This gig will be the peak of our career, and we'll probably never top it." Wire added: "When we were young, we used to have the most miserable New Years ever. We were the four saddoes who couldn't get a snog for all the money in the world. It was only when we formed the band that we managed to get over all that. Hopefully, this will be the best one we've ever had." Tickets for Manic Millennium are on The credit card hotlines are as follows (subject to £2.2S booking fee): Cardiff Arena 01222 224488, Cardiff City centre Ticketline 01222 230132, Way Ahead 01222 644996. Personal callers can buy tickets at: Cardiff City Centre Ticketline, Swansea Derricks, Newport Centre, Bristol Our price, London Stargreen. The relevant websites are: www.ticketmaster.co.uk, www.gigsandtours.com and www.tickets-online.co.uk. Doors will open at 6pm, and the festivities will run until 2am. Wire announced that the Manics Will be joined by five other bands, which have yet to be confirmed. Kerrang! understands, however. that Feeder are very much in the running for a support slot. 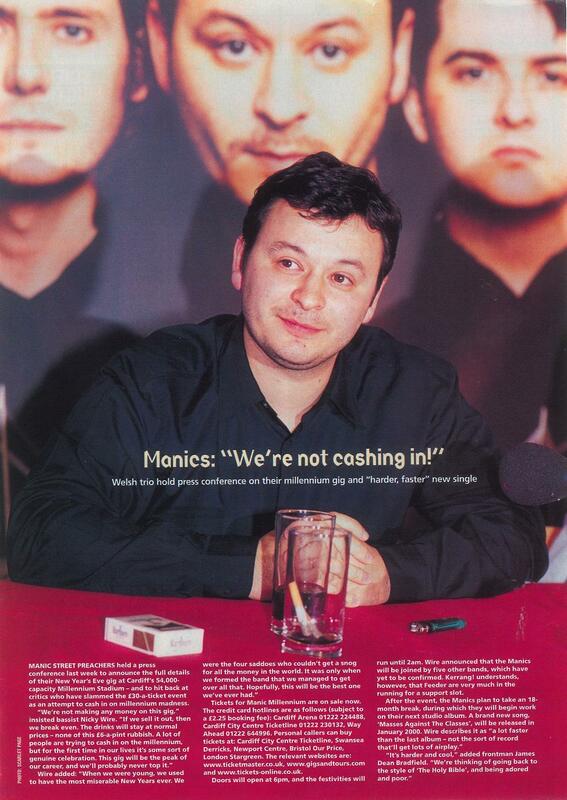 After the event, the Manics plan to take an 18 month break, during which they will begin work on their next studio album. A brand new song, 'Masses Against The Classes', will be released in January 2000. Wire describes it as "a lot faster than the last album - not the sort of record get of airplay." "It's harder and cool" added frontman James Dean Bradfield. "We're thinking of going back to the style of 'The Holy Bible', and being adored and poor." This page was last modified on 23 May 2018, at 07:36.